The other night, after a long evening of dealing with computer issues at home, I decided to head out on the late side over to Clandestino, to get out of the house and to clear my head of all technological thoughts/travails. Over a glass of Powers, some of the regulars and I got into a conversation about the neighborhood; the boys were shocked that while I would make the late-nite walk down to Canal to drink at Clando, I had never been to Marshall Stack, a bar only 3 blocks from my apartment. They told me I would love it. I asked if I would get hit on if I showed up alone. "Er... try it anyway!" they said. I promised I would. Two generous pours later, I made my way home and put "Marshall Stack" on my to-try list. The next day I went online to see what this place was all about. And I have to say -- would you go to this bar, based on this photograph (courtesy of the unfortunately-redesigned Citysearch)? Yeah, it looks pretty terrible, right? It just looks like a lot of people milling about, waiting for a drink. I could imagine a photograph of the interior of a bar, showing happy, drunk patrons and not a lot of the actual interiors. I might think: wow, those people look happy and drunk. That must be a good bar. But that photo of Marshall Stack just makes it look like the photographer was trying to take a picture of the lady in white, and at the last second she turned around. And everyone else just looks kind of ... unhappy. But I was determined to make good on my word. And so Wednesday night, I went to Marshall Stack, with hopes of, at the very least, not just ... milling around. A confession, because I'm a terrible liar: I didn't go to Marshall Stack alone. After a satisfying light meal of bratwurst and liverwurst at Loreley, KS and I traipsed over to Allen and Rivington to see what the Clandy fuss was about. Nice lighting, a very long bar, and a lot of small tables along the massive windows. A jukebox with inoffensive songs (so inoffensive that I can't actually remember any of them). 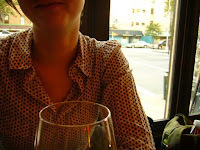 And a ladies-night happy hour that included $4 glasses of a weirdly drinkable Sauvignon Blanc. Also weirdly: I didn't actually get a very good picture of the bar myself. 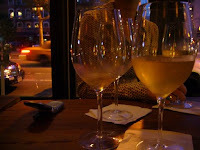 But maybe a photograph of KS and one of our accumulating wine glasses might convince you of the bar's charms? The upshot: I would go to Marshall Stack alone, because having now been there, I can see what the nice Clandestino boys were getting at: it's a decent neighborhood spot that is, in fact, open earlier than my beloved c-bar -- and with happy hour specials. It was a Wednesday night, so it was hard to assess how insane the bar might get on the weekends, or around midnight, but we were there till nearly 10, and the noise and crowd levels were completely manageable. One downside: they've got a small food menu, featuring cheese plates and pressed sandwiches. All fine and good, except that the entire place smells of grilled cheese, no matter where you sit; it's one of those savory smells that I'm ok with, but to others it's overwhelming and pungent. Your call. Regardless, I'm pretty sure I could sit in there with a book and not get harassed -- unless it's by a random fellow explaining to me that he hasn't read a book since 1990, in which case it would be sort of charming and innocuous. That said, please leave me to my drinking.